Very Nice, L/ Certified, CARFAX 1-Owner, LOW MILES - 17,485! EPA 30 MPG Hwy/21 MPG City! Heated Seats, Onboard Communications System, CD Player, iPod/MP3 Input, Lane Keeping Assist, Dual Zone A/C, Keyless Start, PREMIER PACKAGE READ MORE! Back-Up Camera, Satellite Radio, iPod/MP3 Input, CD Player, Onboard Communications System, Keyless Start, Dual Zone A/C, Lane Keeping Assist MP3 Player, Keyless Entry, Remote Trunk Release, Child Safety Locks, Steering Wheel Controls. PREMIER PACKAGE Driver Seat Memory, Heated & Ventilated Front Seats, Wheels: 17" Split 10-Spoke w/Dark Grey, Power Tilt & Telescopic Steering Wheel w/Memory, Wood Trim, BLIND SPOT MONITOR W/REAR CROSS TRAFFIC ALERT lane change assist, FRONT & REAR INTUITIVE PARKING ASSIST clearance and back sonar, HEATED WOOD & LEATHER TRIMMED STEERING WHEEL, ACCESSORY PACKAGE Cargo Net, Carpet Trunk Mat, Key Gloves, Alloy Wheel Locks. 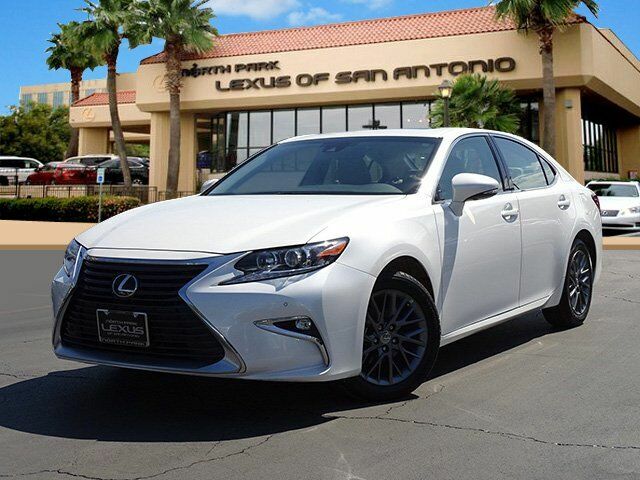 Lexus ES 350 with Eminent White Pearl exterior and Stratus Gray w/Birds Eye interior features a V6 Cylinder Engine with 268 HP at 6200 RPM*. Serviced here, Originally bought here, CARFAX Certified One Owner, LOW MILES! Clean CarFax! Great color! Service Current. Lane Keeping Assist, Blind Spot Monitor, Cross-Traffic Alert, Child Safety Locks Great Gas Mileage: 30 MPG Hwy. KBB.com's review says "The ES soaks up road imperfections like a sponge in water, yet its driving dynamics are far from soft or disconnected. ".